Designer Celerie Kemble chats with Bob about color, showhouses, kids and her new book, "Black & White (and a Bit in Between)." Bob Vila: Was your mom a big influence on you becoming a designer? Celerie Kemble: Well, I think being lucky enough to grow up in a very personal and beautiful house made me aware, from an early age, of the kind of pleasure a well-designed home brings and how much it adds to a family’s sense of connectedness and identity. Even in high school and college, I realized how much I was drawn to design and how much work and thought went into creating something as special as the house I grew up in. Bob Vila: What do you think you learned from your mom? Celerie Kemble: I learned to respect craftsmanship and artistry, and that without great risk it’s hard to see a home become distinctive and special. She set a very high bar and I’m continually challenged to make everything that I do really dynamic. Through her I also learned how to look at a space or an empty room and envision it as a reflection of the homeowners. Bob Vila: Is the hardest part of your job working with the client? Trying to figure out what’s right for them? Celerie Kemble: I think the hardest part is always explaining that, no matter what funds they have on hand or what their plan is, there is a lot of compromise involved—compromise because of the construction of the house, the architecture, the cost, and the internal family dynamics. You rarely design for one person. So it’s not hard taking on someone’s priorities and trying to work with their best interest in mind. What’s hard is doing that at the same time you’re educating them about the compromises and challenges that may need to be made along the way. It’s all about navigating compromise. Bob Vila: I love that. . . ‘navigating compromise.’ So if that’s the most challenging aspect, what’s the most enjoyable? Celerie Kemble: There is a certain sort of intimacy and trust that is required between a designer and client, and I think the enjoyable part, at least for me, is getting to know someone well enough to help realize their dreams. To be able to use the tools of my trade—color, fabric, pattern, furniture, and construction—to really change the entire disposition of an interior space. 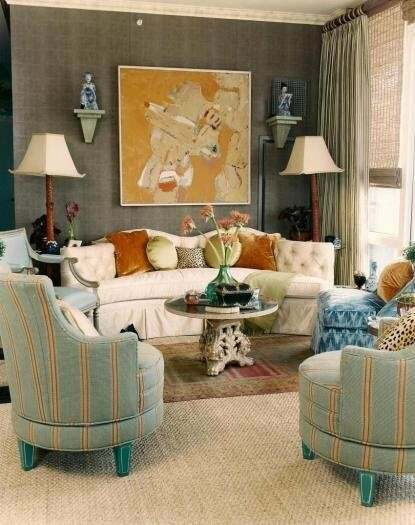 Bob Vila: Let’s talk color. When I was contracting in the seventies, I was always asked about using color, even though I didn’t do interiors. I remember a lady in New York that sold rugs who said that the carpet was the soul of the room. But if you don’t have a carpet, how do you begin the process of choosing color? Celerie Kemble: I actually think your carpet lady wasn’t far off. For me, the soul of the room is in the fabrics or in the wallpaper, and I usually try to find one element that has at least 70% of the colors that I intend to incorporate into the room. It could be a piece of pottery, a beautiful dish, a painting, or a scrap of fabric or wallpaper; something that I can use in the room that links the majority of other disparate elements together. And, once you have that one thing—for your lady friend the carpet; for me the wallpaper or upholstery—then you have something to help keep everything cohesive. Bob Vila: What about mixing all those things? Are there any rules that you can offer about the best ways to mix colors and materials successfully? Celerie Kemble: I think that it’s important to know your base non-color so that your whites or your creams are pretty consistent throughout the space, and people forget that. They concentrate on a color, and they miss that the most cohesive element might be having all of your whites (for trim and molding) be the same. The next thing is to look at the value of each color. I don’t believe you have to limit the number of colors or that there are bad color combinations, but you do need to consider the hues, tones, and shades of the colors. Bob Vila: You don’t think there is any such thing as a wrong color combination? Celerie Kemble: Well, I think all colors could be made to work together, but what people need to do is be sure to vary the intensity and value. If you have five strong, bold colors in one room, it’s just going to feel blocky, heavy, and dark. You need some colors that have a slight amount of opacity, transparency, a lightness, a feathering. Celerie Kemble: If somebody were to take all of their pigments directly out of the tube and paint with every single color, it would look sort of childlike and heavy handed. But if you cut some of the colors—you know, water them down—the mix becomes more interesting. So, I think it’s about moderating the intensity of whatever colors you are using together so that there is some variety; something light, something heavy, something in the middle—two or three balancing parts. People always talk about color, but I think it’s more about balancing values and intensities to create variety in a room.